I have an embarrassing confession to make – I’ve never been to New Orleans. There. I’ve said it. Y’all are probably tempted right now to revoke my status as a card-carrying American Ghoul and strip me of my poppet collection. But hey, it’s not for lack of desire, only for lack of time and funds. The Crescent City has always been at or near the top of my places-I-need-to-go-while-I-still-have-my-own-teeth list, for reasons too numerous and obvious to mention here. Okay … I’ll mention one. 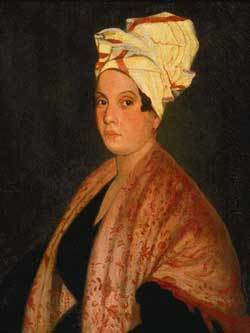 Marie Laveau. I need NEED to visit that woman’s crypt – see the offerings and markings for myself and feel that witchy electricity. I have a friend (who I mention here a lot) who made the pilgrimage when she was in school in Texas. Being young and rash she took home a token from Marie’s grave – a wee crumble of marble – planning to do god-knows-what with it, but not imagining the craziness that would ensue. Long story short – before she could return the crumble to its rightful place she died, was revived, and found her entire being tuned to a wild and dangerous new frequency. Don’t mess with the Voodoo Queen of New Orleans – or her marble crumbles! Among the most famous magical practitioners in the world, priestess, spirit medium, healer, diviner, and professional spell-caster Marie Laveau organized and formalized modern New Orleans Voodoo and fearlessly became the public face of what had largely been a secret, outlawed tradition. Proclaiming herself the Pope of Voodoo, she was a tremendously public figure in 19th-century New Orleans, refusing to linger in the shadows. Marie attended mass daily in a Roman Catholic Church and tended the sick during yellow fever epidemics. Notorious in her own lifetime, Marie was credited with many magical feats, including saving clients from disasters. Her specialty was legal work: through her efforts, clients and members of their families were released from prison and rescued from dire straits. Marie’s personal life remains mysterious. Her birth year is generally considered to be 1801, but it may have been earlier. Of African, European, and Native American ancestry, she was born into a Louisiana family reputedly well-versed in hoodoo and Voodoo. She was a “free person of color,” a legal classification unique to French colonies, as French law distinguished between enslaved and free people of African ancestry. She was a politically conscious person who secretly helped redeem slaves and worked with the Underground Railroad to speed the endangered into safer territory. According to a famous legend, when Marie was elderly, she entered the lake, submerged, only to reemerge appearing decades younger, in the manner of a snake, rejuvenated after shedding its skin. Some interpret this as proof of her magic powers. Others claim that this was how she secretly and seamlessly retired; passing her clientele to her look-alike daughter who then assumed her mother’s identity. In other words, one woman entered the water but another emerged. Both women were named Marie and used the last name Glapion (name of the husband of one and the father of the other). Although some believe Marie achieved immortality and roams the French Quarter still, others think she died on June 15, 1881 and that it’s her ghost haunting the Quarter. In death, Marie has achieved the status of a spirit or saint. Her grave in New Orleans’ oldest cemetery, St. Louis Cemetery Number One, is visited by thousands annually who come to pay tribute or beg for favors, which she reputedly delivers. In recent years, Laveau has also taken her place among the lwa, the pantheon of ancestral spirits of Voodoo and Vodou. Devotees consider her to be one of the Ezili family of beautiful, powerful female spirits, many of whom are closely associated with water and snakes. Marie Laveau’s celebrity status continues to extend today. Several songs in various musical genres pay tribute to her, including “Marie Laveau,” the title of a 1974 song by country singer Bobby Bare. The lyrics, by poet Shel Silverstein, describe Laveau as a “lovely witch.” That song has little to do with the historic Marie—the woman it describes might be any swamp witch—but it hit number one on the U.S. country charts and its popularity furthered Marie’s reputation. A more recent song, Dr. John’s “Marie Laveau, Voodoo Queen,” which calls her a “conjure lady,” more accurately recalls her history. Marie is also the subject of novels and biographies. Dolls are crafted in her image for spiritual use and as tourist’s souvenirs.